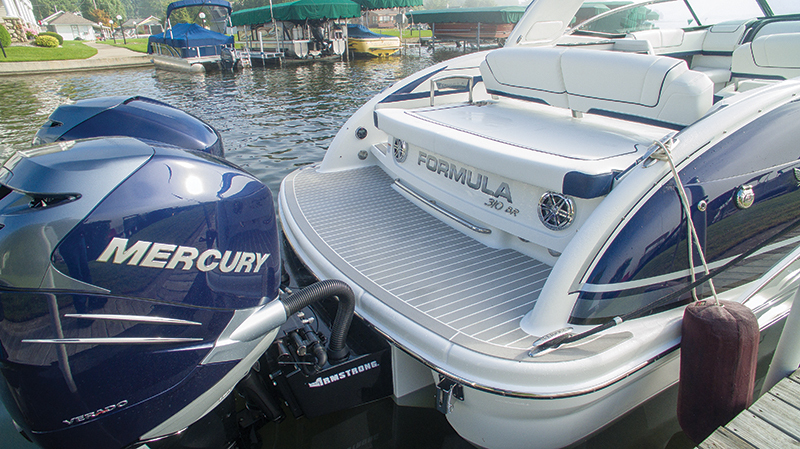 The 310 BR Outboard is a prime example of Formula’s push to develop outboard-powered models. The Formula 310 BR is the flagship of the builder’s Bowrider line, a dayboat capable of excursions to simply drop the hook in a private cove or head to the condo in Bimini. 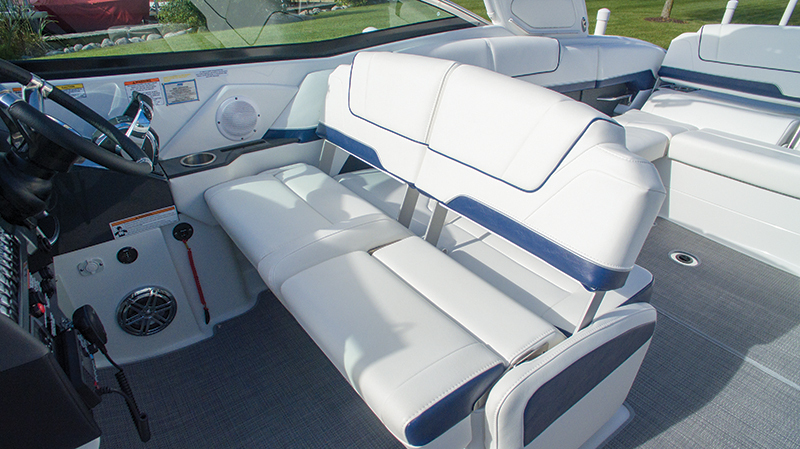 For decades, Formula sportboats have been closely associated with sterndrive power, taking advantage of concealed engines to create a huge back porch for keys-off lounging pleasure. The new outboard version hasn’t lost that feature. It still includes an uncluttered extra-large swim platform, because the twin 350 hp Mercury Verados are mounted on an Armstrong bracket behind the platform. One thing that sets Formula apart from nearly all other boat builders is its use of paint rather than gelcoat to achieve its signature finish. From a manufacturing standpoint, gelcoat is easier to use. It’s an epoxy resin that can be pigmented, and it is the first thing that is sprayed into a hull mold before the fiberglass is layered on. Paint is applied after the boat is removed from the mold; it is a lot more technical and requires a separate department to handle. Only a few other high-end companies paint their hulls, including Hatteras and Hinckley, because it’s more expensive. The payoff, though, comes down the road. Gelcoat tends to oxidize and take on a hazy, chalky appearance after a few seasons — especially dark colors — and it needs to be buffed and waxed to stay shiny. Paint really just needs to be cleaned. Formula carries its process even further by applying an Axalta ChromaPremier base coat and Imron Elite clearcoat to keep its Imron paint looking great for many years. Our Formula 310 BR had the Full Hullside Graphic C in Midnight Blue Metallic with Steel Metallic accents paint job, which added $5,595 to the price. But what really made it pop was the fact the color scheme was carried over to the Mercury Verado 350 outboards. What’s the point of a builder having a paint shop if it doesn’t use it to customize the outboard’s cowling? The process added another $5,745 per engine to the price, but that’s inexpensive compared to what most aftermarket companies charge. 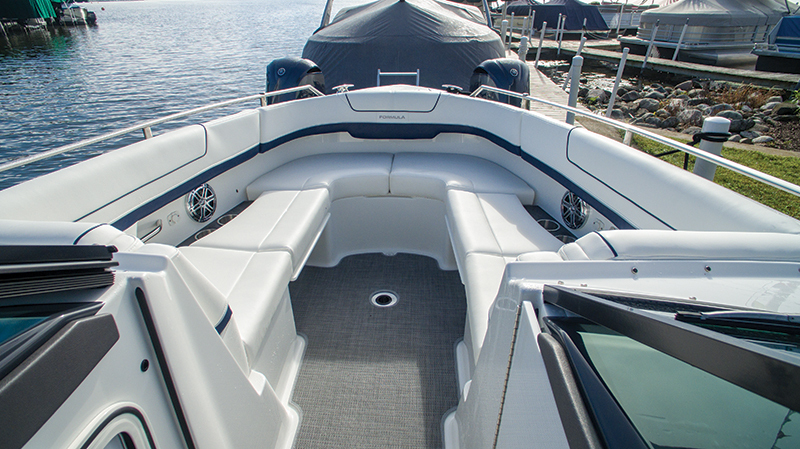 For further customization, Formula offers FormulaFlex MyWay, which allows buyers to choose any of the 1,867 solid colors in the Pantone Matching System or any of the thousands of colors from major automotive manufacturers, to create a one-of-a-kind boat. Powering our Formula 310 BR test boat was a pair of Mercury Verado 350 outboards, which is one of two outboard choices for this model, the other being Mercury 400R Racing engines. Most often, when companies make the transition to outboards, which is the new customer power preference, they slap an outboard on an existing model and call it a day. But that’s not the Formula way. It invested money to change the hull and better optimize its performance. During our test, not too far from where Formula builds in northern Indiana, I timed the near-five-ton 310 BR to plane without using the hydraulic Bennett trim tabs: five seconds with moderate bowrise. Next, I engaged the tabs, and the 310 BR reached plane in just 2.8 seconds with virtually no bowrise. Thanks to the low-end boot-in-the-seat-of-the-pants kick provided by the Verados’ superchargers, the 310 BR hit the 30 mph mark in just 7.6 seconds. Top speed was a brisk 52.4 mph. 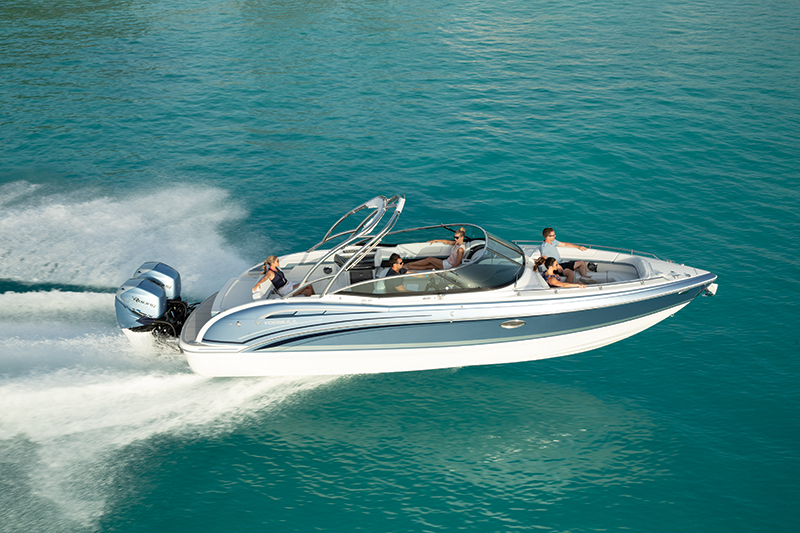 With twin 400Rs, this boat should scare 60 mph, but given the $21,600 upcharge, I’d stick with the twin 350s. Most boaters start their aquatic career with small boats and gradually work up the LOA food chain, gaining boat-handling skills along the way. But thanks to Mercury’s intuitive Joystick Piloting For Outboards, aka Axius, which is part of the standard package, buyers can confidently make the leap from a small boat to this 32-foot, 8-incher with a 9-foot, 8-inch beam. Recent enhancements to the Skyhook virtual-anchor feature include BowHook, which maintains the boat’s position but allows it to point in any direction, so the engines shift far fewer times; DriftHook, which maintains the boat’s heading but allows it to drift with the wind or current; and Heading Adjust, which allows the driver to change its heading in 1- to 10-degree increments while Skyhook is engaged. The Formula 310 BR’s hull has a sharp 22-degree deadrise that handles choppy water so well owners will be disappointed when conditions are flat calm. One trait of every Formula I’ve ever driven is a non-existent learning curve, and the 310 BR continues that tradition. It’s simpler to drive thanks to Mercury’s Active Trim, which automatically keeps the boat running with the correct engine trim. I did have to override it during my quest for the last 1 or 2 mph of top speed during the test, but it otherwise did an admirable job. Making control even easier is Bennett’s AutoTrim Pro system. Cruising, entertaining and watersports are the Formula 310 BR’s triple areas of expertise. With the keys off, the rear sunpad lounge will be the first place passengers try to claim on dibs. Its split backrest flips to brace aft-facing loungers and is easy to adjust to the perfect angle. Underway, the backrests can be flipped to support people sitting on the stern bench. A couple of years ago, the cockpit layout got a complete makeover based on input from owners, and the result is improved passenger flow and more flexible and comfortable seating. Cockpit access is via a portside walkthrough. A compact entertainment center for beverages and snacks is the most prominent feature. Four cupholders start the assembly line, underneath drawer storage delivers quick access and more storage can be found to the left. Twin sinks with a spigot help with cleanups. Our boat had an optional pullout drawer refrigerator ($2,225) to augment the underseat cooler. In front of the entertainment center is an abbreviated chaise lounge that’s comfortable for passengers facing fore or aft. Behind the doublewide captain’s chair is a longer layback seat that’s part of a U-lounge. Split helm backrests flip, so the person sitting to the left of the driver can also face fore or aft; at rest, the captain can join the party behind him. With the giant twin-pedestal Corian-topped cockpit table installed, there’s a dining area for at least six people. Even though the Formula 310 BR has a pointy bow that helps announce it as a performance boat, its versatile bow has plenty of room for two people to sit facing aft. Remove the chaise lounge center sections, and more people can enjoy feet-on-the-deck seating when facing fore and aft. Adding the optional SureShade ($1,475) controls the amount of sun passengers get, and the optional windlass, which includes a polished stainless steel anchor, chain and rode, is a must ($6,610). 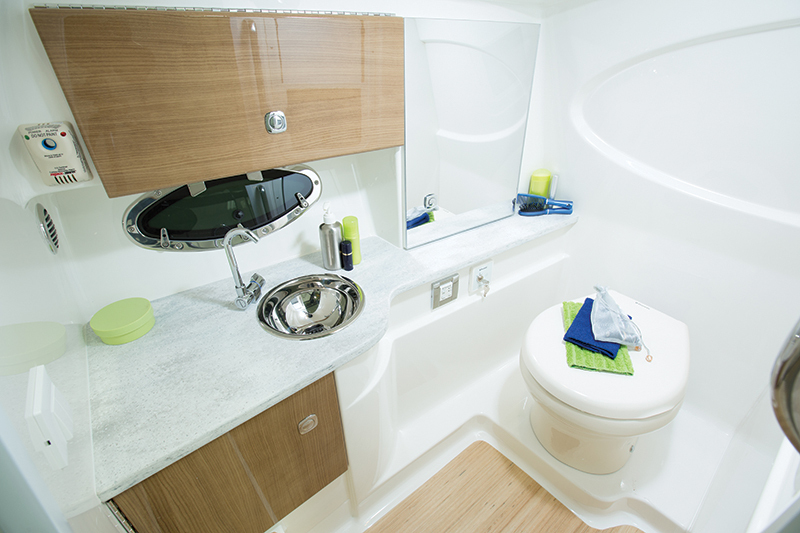 In the portside console is a head compartment that comes complete with a stainless sink and a VacuFlush head that has a 36-gallon holding tank. Owners can choose one of four colors for the Corian countertops. Make no mistake: Formula is a premium brand that commands a commensurate price. With twin Mercury Verado 350s, the 310 BR lists for $356,330, but Formula always seems to be running a special. At press time, its website showed a $71,320 discount. But anyone buying this boat wants it exactly right and won’t be skimping to save a buck. With that in mind, buyers should get the forward-swept arch ($15,290) with a swivel watersports tow point and the Sunbrella sun shade. 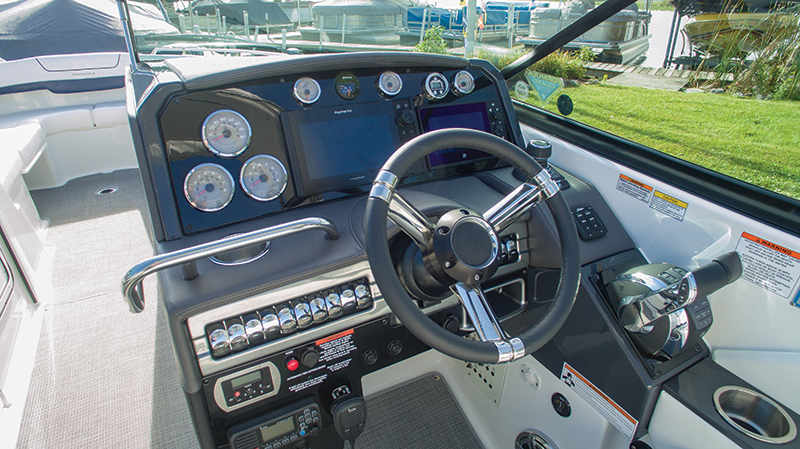 At the helm, there’s room for a flush-mounted Raymarine Axiom Pro 9 GPS/fishfinder. PURCHASED BY DAVE AND SANDY REIF, NAPLES, FLA. PURCHASED AT FORMULA BOATS SOUTH, NAPLES, FLA.
We would like a larger hardtop option. For 30 years we did our boating in Ocean City, N.J., and always had sterndrives. When we bought a house in Naples on the southwest coast of Florida, we noticed most of the boats down here have outboards, because the water can get pretty shallow in places. My wife and I really like to get out and cruise, and our trips are usually three or four hours. We like to invite a couple or two and do a sunset cruise and just idle around Naples, enjoying the scenery. 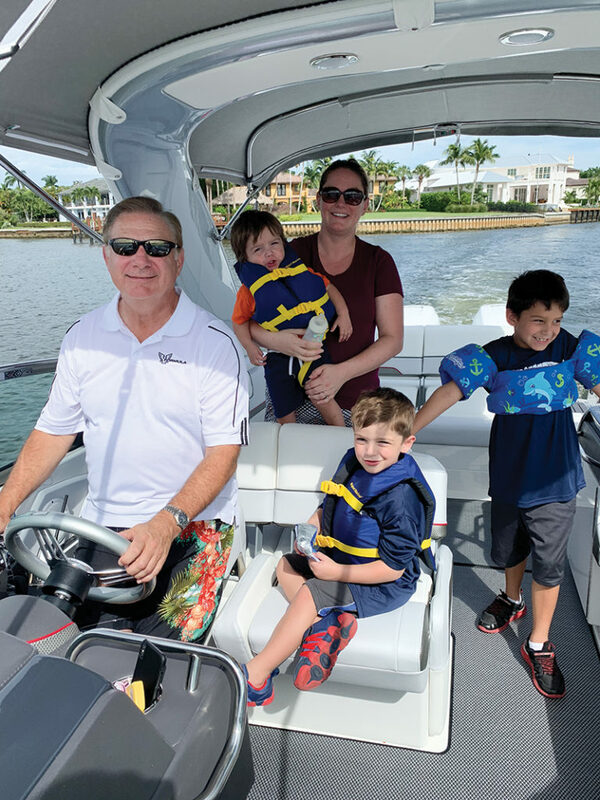 We have grandkids from 2 to 7 years old, and their security was really important to us; the Formula 310 BR has high gunwales, which helps us relax, knowing they’re safe. We love the power and performance from the Mercury 350 Verado outboards and appreciate the high-tech features like Active Trim; it lets me hit the throttle and go. The joystick docking is great. The buying experience at Formula Boats South was smooth; they were fair, honest and transparent. Denny, Steve and Scott worked as a team to give us a first-rate experience. LOA: 32 ft., 8 in. Beam: 9 ft., 6 in. Dry Weight: (hull) 9,875 lbs. Time to Plane: (w/trim tabs) 2.8 sec. Time to 30 mph: 7.6 sec.